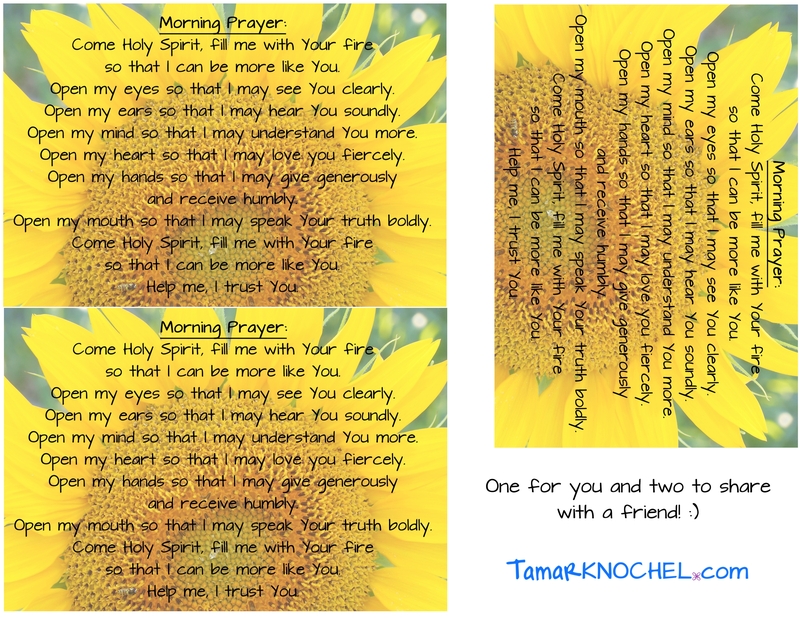 Tamar Knochel | Living Life one CRAZY day at a time! Ok. I know it’s been a really long time since I’ve posted on here, but I feel like I absolutely positively cannot finish this day without sharing this story with you! This is a true story from my past. The first piece of new furniture my husband bought for me was a rocking chair, a simple, neither ornate nor fancy, rocking chair. I cherished it and it became the spot where I sang, prayed, read, sewed, rocked my children and filled it with love. I stayed inside the house while that chair sold, unable to watch it go. Of all our sold possessions, that was the most precious. Unbeknownst to me, the couple that purchased that chair desperately wanted children but, as yet, had none. But God heard our prayers and the couple was soon blessed with a lovely girl. This was a special blessing for me because it was my brother and his wife that purchased the rocker so I got a beautiful niece, and later a handsome nephew from God. Years rolled by and the chair was returned to me for my eldest daughter’s first two children. The chair fell apart and I decided to sell it at a garage sale. This time, the rocker was in pieces in a little open box and very well worn. Most people simply walked by. One older couple and their daughter were drawn to the chair parts. They spent a long time just looking so I walked over and told them the story of the rocker. Their eyes lighted as they told me that the daughter and her husband had been trying, unsuccessfully, to bear children. The dad enjoyed rebuilding old furniture and they would give it a good home. I do not know where the rocker is now but I believe that God blessed every family that has owned it. I am thankful for each soul that found comfort while sitting in that simple wooden chair. I seriously can’t stop crying! I’M THAT BABY! And while I knew that story, I haven’t heard it in YEARS (probably around the time that Mary got it). And yet today this story falls on a heart that far too often beats its self up for not being enough, not skinny enough, not smart enough, not good enough, not strong enough, the list goes on and on. And yet here I am, on Facebook because school is canceled today and I have plenty of other things I can and should do around the house but I’m on Facebook and end up reading about ME and that my conception and birth story is being passed on and giving others hope for a future filled with family and love and hugs and baby snuggles! And it’s inspiring ME and helping me realize that all those slings and arrows I fire at myself, I’m firing them at her too (that baby in the miracle rocker). That baby whose story has brought hope to a family. That baby was (and still is) more than enough because she is fearfully and wonderfully made and she needs to recognize it more often! She (I) was prayed for, wanted, loved, cherished (even when I was naughty). Yes, I’m an adult now with two miracle babies of my own, who were also prayed for, loved & cherished, and while I would never sling those arrows at them either, I shoot them at myself. Well no longer! New new years resolution: be nice to MYSELF because I’m all God made me to be – ME! Friends, go be YOU today! Because YOU are enough! YOU are fearfully and wonderfully made – know it to the bottom of your toes! You are beautiful! Click the pic above for a printable version! I just went to write a new post and found this one from FALL BREAK! Enjoy! It’s Fall Break here! 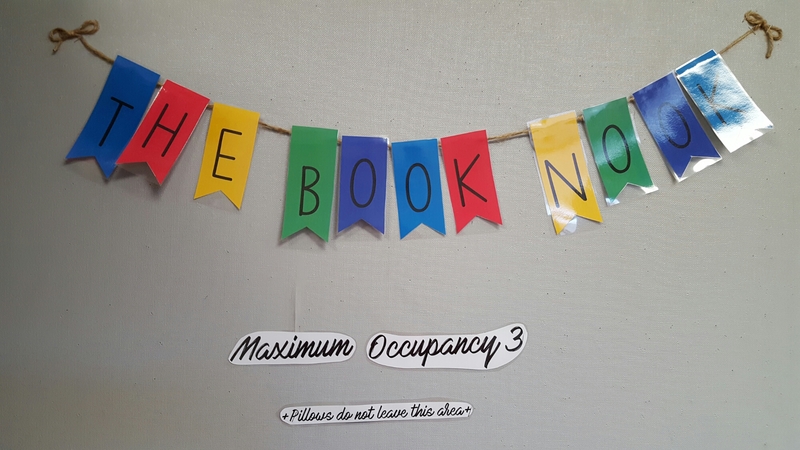 And what better to do than spend half of it… AT SCHOOL! 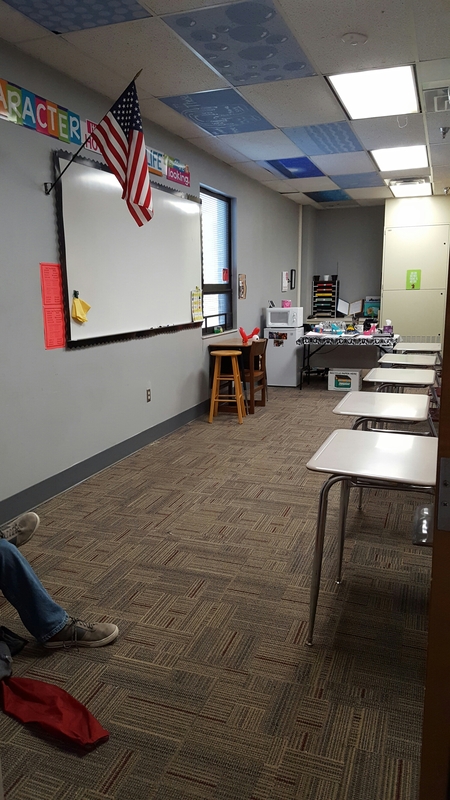 For most people that wouldn’t be a break from school, but there is nowhere more peaceful than a school building during a break! Plus, it’s my happy place right now. Especially since it’s been my lifelong dream to be a public school teacher and I didn’t get the job until two days before school started so I had basically zero time to do anything with it other than throw things in and say, “Voila! It’ll have to do.” So when the grandparents requested my kiddos for the week I, reluctantly, agreed. And when I say reluctantly, I mean I let my kids go with them, kicking and screaming the whole time because *I* wanted them all to myself this week. I also wanted all summer to prepare for my school year but that didn’t happen now did it. So I took my lemons and made lemonade. Sean has had to work all week so I would’ve been home alone anyway. Might as well drive the two minutes to school and play, I mean work, in my room right? 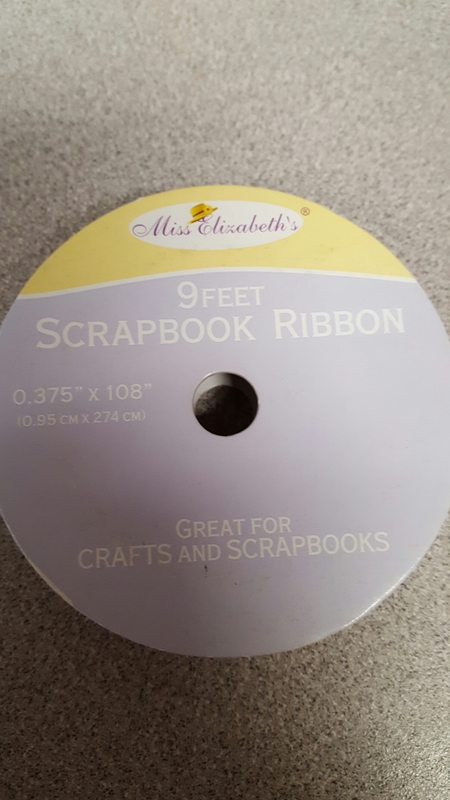 I have always loved being crafty and this week has been no different! 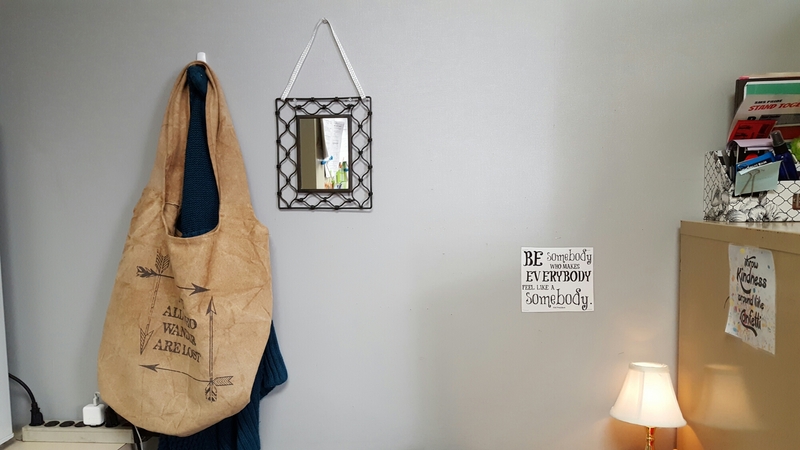 I’m so excited to share my room makeover with you all! 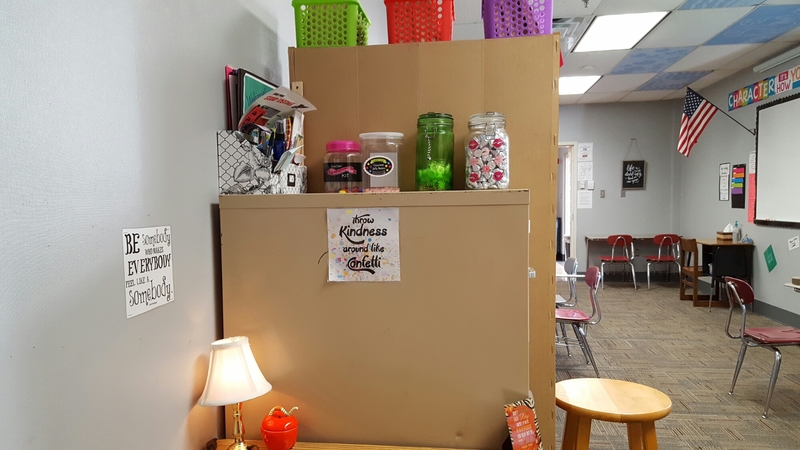 AND as an added bonus, I have made a few of the items from my room available through my new Teacher’s Pay Teachers store! Yay! The left side of the room from the door. 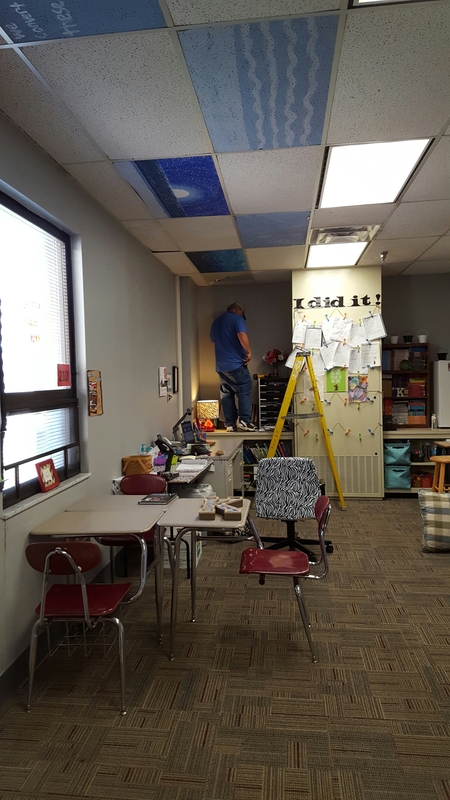 And although the painted ceiling tiles are awesome I don’t get to keep them, they’re going back to the former tenant. But I’m going to decorate my own. I had a LOT of issues with the desks being smack up against the wall. Many of the 6th graders would exploit that fact to do things on their Chromebooks they weren’t supposed to because I couldn’t see their screens unless I was RIGHT next to them. Which always gave them time to exit out by the time I got there. The board, I’m actually still really happy with this part of my room. I 💙 the border around the board! This is the focal point of the room and the banner above the board is where I got the colors for the room. I love this shelf full of class sets of books! It just makes me so very happy! These are my independent work stations. I did a growth mindset lesson on this quote at the beginning of the year. 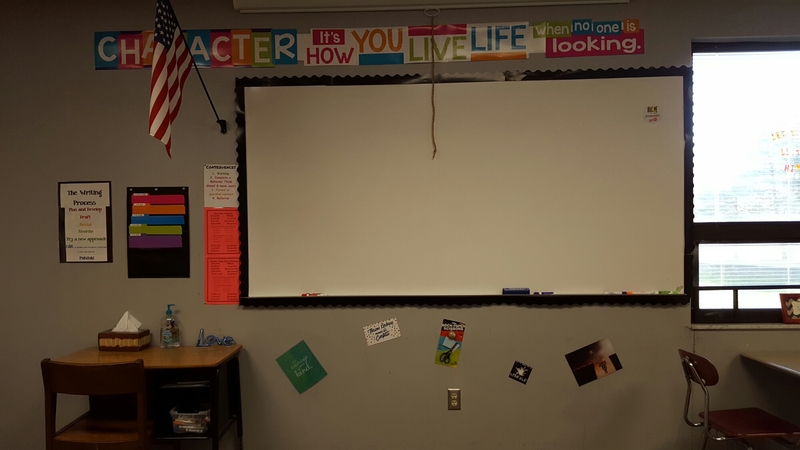 This is our, “I did it!” wall. Any time the students have something they’re really proud to have accomplished we put it on this wall. By the end of this first 9 weeks the wall was a MESS! A happy one full of A & B’s tests but still, they were everywhere and it was driving me bonkers! 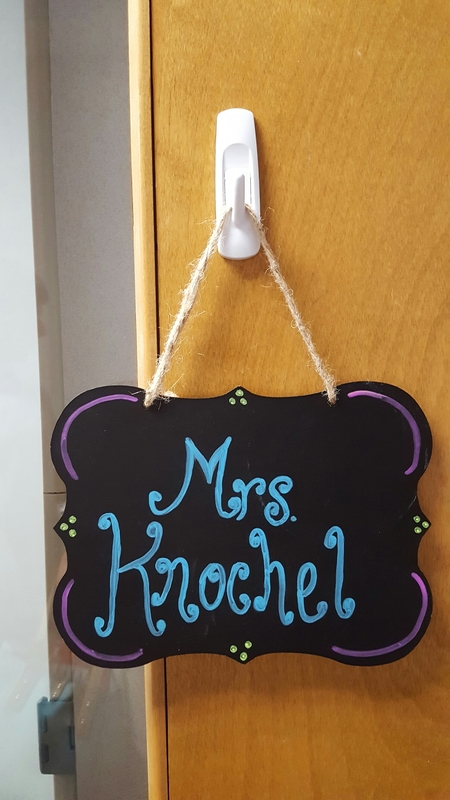 And with only 2 days before the start of school they certainly didn’t have time to make a name plate for me so I turned this little sign I had into one! Not bad for only having 1 day to prepare it! BUT I knew I could do better. Here’s what it looks like now! I originally had my turn in folders over by my desk, for better traffic flow I moved them next to the board. I also added a tissue/extra paper station under it. I’m not sure you if you can see it but right above the outlet there is a Rock, Paper Scissors kit I found at Meijer. It’s one of the favorite items in my room. It’s a rock shaped eraser, post it notes & a pair of kid scissors. 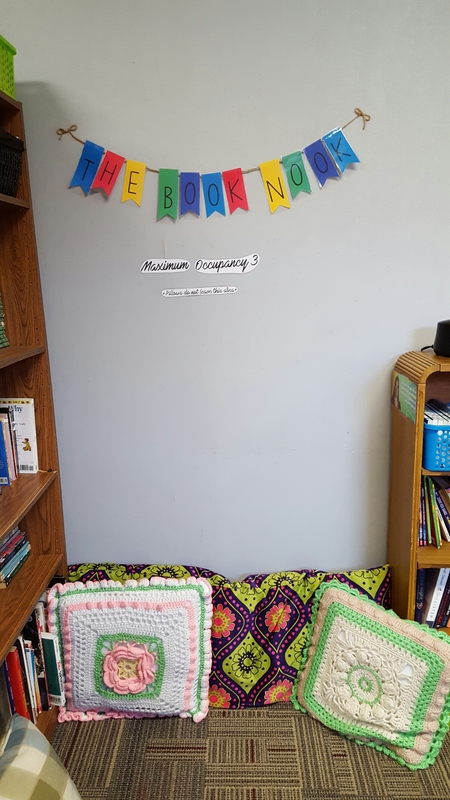 “The Reading Corner” has transformed into, “The Book Nook.” I pushed the smaller shelf over to the bigger shelf to create a more intimate space. The original configuration with the pillows strewn across a third of the room facilitated pillow fights and jumping into them like a pile of leaves. This doesn’t. Plus the rules are clearly posted and will continue to be discussed throughout the year. The adorable twine banner I’m completely in love with is available as a PDF printable here in my Teachers Pay Teachers store. 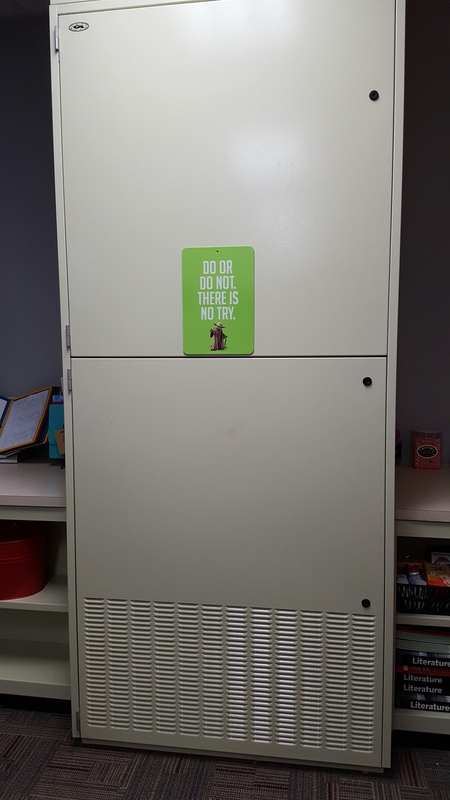 The fridge got hoisted by yours truly onto the counter behind my independent work desk. 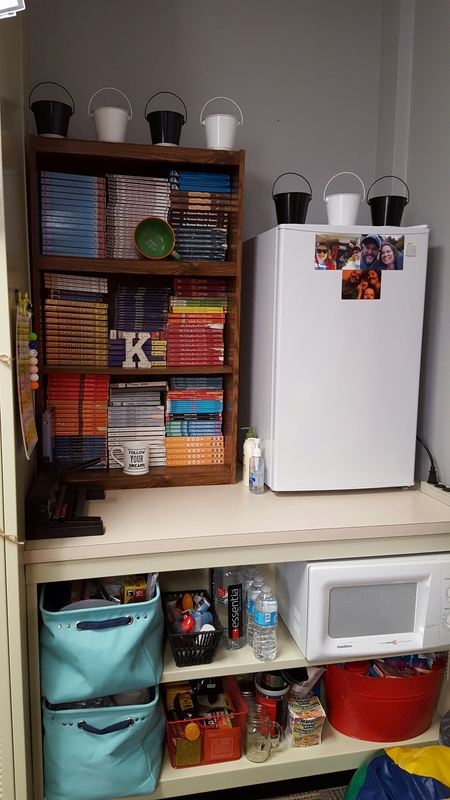 This is where all my children’s after school snacks found a home so it just made sense to make it a little kitchenette. 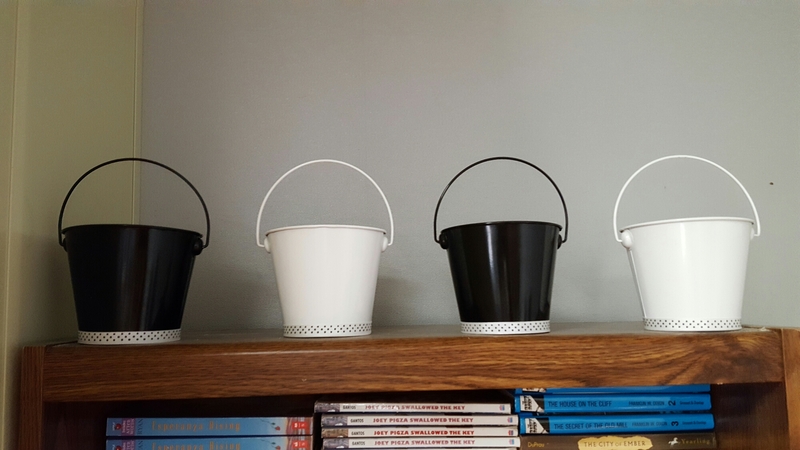 I’m not sure that you can see very well in the pictures but I decorated the small pails as well with a white ribbon with black polka dots. The pails were a Target Dollar spot find and the ribbon was a Michaels Dollar spot find! Next to that is my coat hook and a mirror, always handy. This space may get a Keurig coffee maker added to it because Sean just gave me one for my birthday this morning before he left! 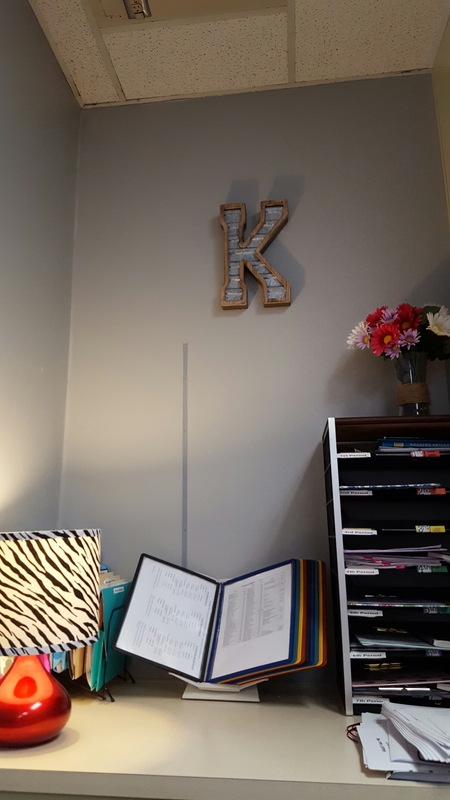 Sam our amazing janitor hung this K for me that I found at Hobby Lobby for 50% off. I had been wanting one of their metal K’s for months but never wanted to pay that much for them, but 50% off was impossible for me to resist. And this one has a wood frame even! Thanks again Sam! In this pic, that I know Sam would hate, you can see the I did it wall redesigned. I used twine again to carry the theme through the room. Over the summer I had found 5 $1 packages of 6 neon colored flower clips each that were perfect for this spot! 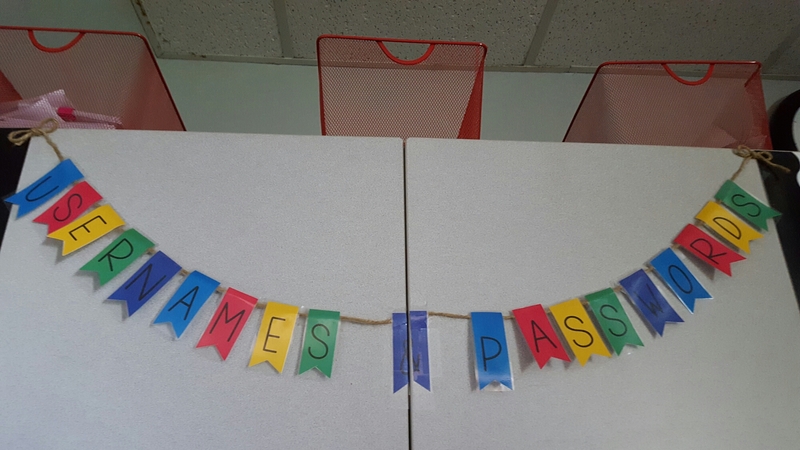 Now each of my students has their very own clip on the wall. When I introduced it to them yesterday they were so excited! Several of them immediately started digging through their folders for a paper to put on the wall. It was really kind of awesome. Here’s another of my 50% off Hobby Lobby indulgences. These kiddos have been through a LOT! At a young age life has handed them not one, but a bowl full of lemons. Their brains don’t process information quite like every one else’s do and that has made public school learning very difficult for them. 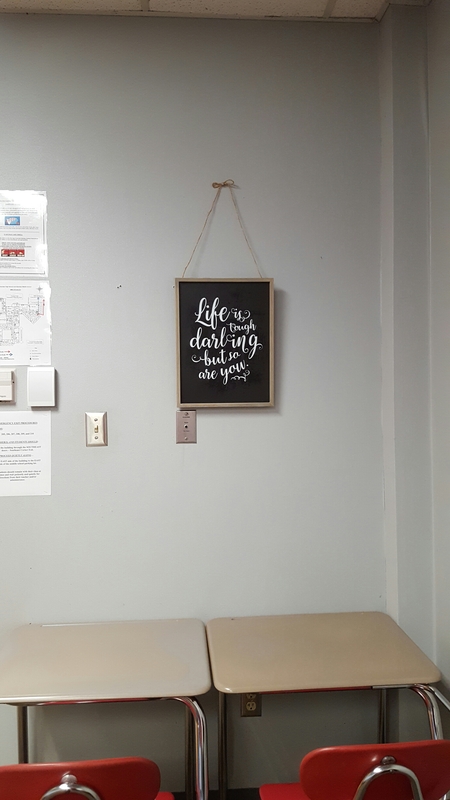 Life, for them, has been tough so the instant I saw this sign I knew I had to have it! 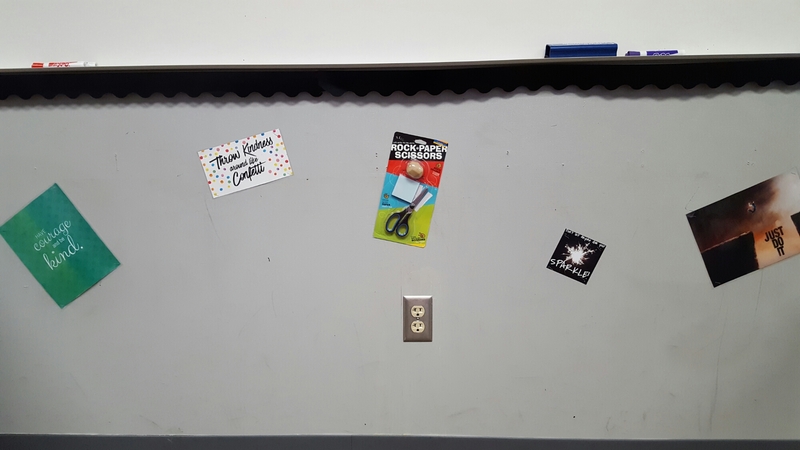 My goal is to take pictures of each student being “tough” and then surround the sign with their pictures. I want them to KNOW that when they leave that room and go back into the world that they are tougher than anything they will face out there. 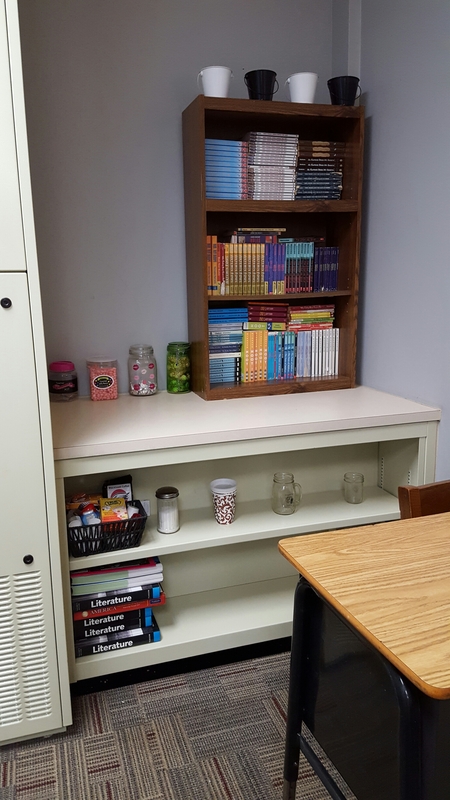 I also have these two desks facing the wall. It makes them look like time out desks, they’re not. 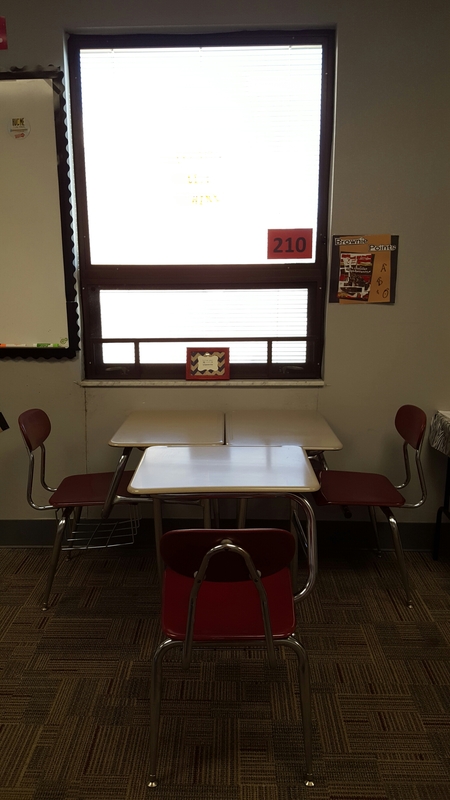 Iwanted to have a space where a group of two could work together nicely and that was the only way the desks would fit in the space. I made site to emphasize that to the kids yesterday. Here I have a group of 3 desks for those who prefer a window seat decorated with some more inspiration from Sheridan’s own Market on Main. I’ll be working this saying into a lesson in the next few weeks. And I’ve downloaded some cute arrows to decorate with! 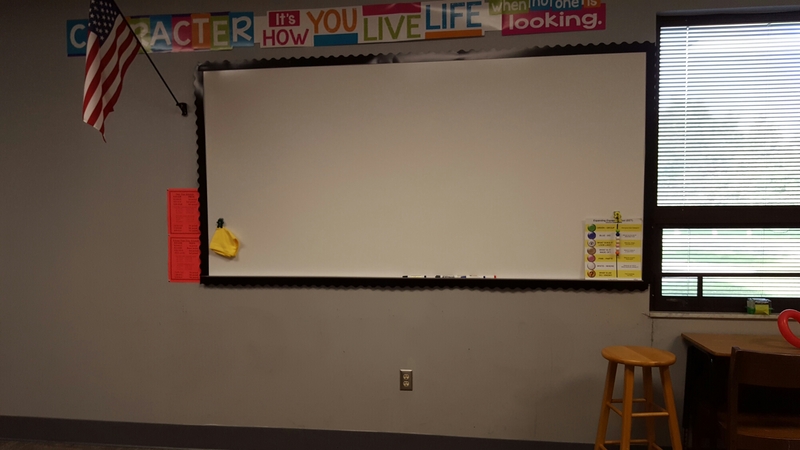 The Brownie Points board was birthed last year when I got my first Guided Study class. The main purpose of the class is to reinforce what is being taught in the General Education classes and helping them get their homework finished. Well, I knew from experience that the number one problem for my students was getting their homework done AND turned in on time. So I needed an incentive program to help them do this because obviously the intrinsic reward of finished work wasn’t enough for them. I am a total believer in food dye allergies especially in kids with ADHD, a large majority of the kids in the Special Ed program. I have SEEN kids before and after food dye and is not always pretty! So naturally I avoid them at all cost in my student rewards. Chocolate has food dyes. And usually little to no preservatives even, depending on the product. So when I saw this idea on Pinterest I knew it was for me! 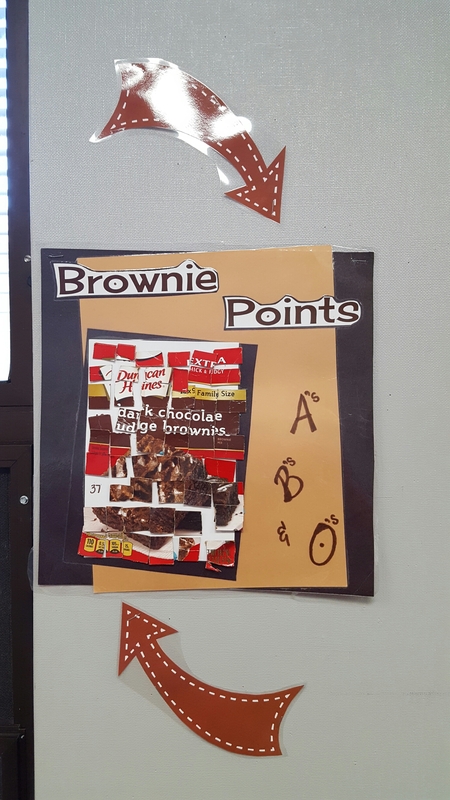 I check the students Powerschool accounts every Friday, if they have zero zeros (no missing work) they get a Hershey kiss and a brownie point for the board. Any time they get an A or B on a test, they get a Hershey Kiss and a Brownie Point. Once the board fills up we have a brownie party. I bring in the ingredients to make a glass pie plate of microwave brownies and I make them FRESH during class. And here is the user names and passwords banner you can find here in my Teachers Pay Teachers store. Ok ya’ll, I’ve been working in this post for a WEEK, it’s time to declare it done whether it is or not. I just had a dream that is waking me up! I’ve been, as God put it, “Running with the ball”. He gave me this gift of this room and I’ve been running around clutching it hoping everyone would see how pretty it is in the hopes that I would get to keep it. But that’s not how God works. And it’s not the important thing either. I spent all of fall break making my room look pretty. And then last night had to stay up until midnight in order to finish an IEP for a case conference first thing this morning. Were my priorities in the right place? No. Obviously they weren’t! While it’s fun and so nice to have a nice clean pretty room now. That’s not the most important thing. The most important thing, in football terms, is that the goal gets made. Not that I have to be the one to make the goal. Sometimes, instead of running around with the ball trying to get everyone’s attention on the field, it’s better to pass the ball to the one who is guaranteed to be able to make the touchdown. I may not be the one to make the touch down myself, but at least I can be the one who made the touchdown pass. In spiritual terms, God is the only one who can truly make the touchdown goal. And if I’m not passing the ball to him in order to get the touchdown, there’s a very good chance that the touchdown won’t get made. However if I pass the ball back to him, it’s guaranteed to get made! So while I can run around clutching things to my chest I might get the attention that I want from others, but I’m not getting the attention for the right things. I’m not getting any attention for making a touchdown pass, I’m just getting attention. Sometimes we just have to pass the ball to the one who can make the touchdown. God blesses us in order for us to be a blessing to others. That requires that we take the things that God has given us and give them to others, not hold on to them for our own selfish reasons. Is there something that you are holding on to? Is there something that God has been asking you to let go of, and you’re not? Pass it to him! I have been floundering a lot lately. I have been trying to swim in a race, while carrying heavy burdens that I don’t need to be carrying. And if I would only give them to God and let him take care of them, that would free up my hands so that I can swim fully! Lord I give you my world, I give you my doubt. Father I give you back the blessings that you have graciously bestowed upon me! I give them back not because I don’t want them, or because I don’t appreciate them, but because I do! I now understand that I have been clutching things to my chest and running away from you with them in the hopes that I would get to keep them. Not understanding, that you gave them to me because you wanted me to have them and that you won’t take them away. I now realize that you gave them to me to keep and to cherish and to use appropriately. Lord I know that I have been acting as if the things that you’ve been giving me we’re only temporary and wouldn’t last. But that’s not the kind of gifts that you give. All good gifts come from above! And if you ask us to give something away, it’s only because you have something better in mind to give us in exchange! Please help me to let go of the things that I don’t need to be holding on to you! Help me to let go of the things that are pulling me down in the water keeping me from swimming this race well! I want to swim this race well for you! My friends, this life is a CRAZY ride! I’ve been able to post a couple of times since I started working as our middle school’s Special Education teacher. (I’m loving it by the way.) I’ve shared how it’s been my lifelong dream to be a teacher, and that God has called us blessed us with exceeding fruitfulness. Oh my friends! We truly do have that blessing of fruitfulness on our lives! You are not where you are by random chance! God has placed you precisely where you are for such a time as this! He has called you to bloom where you’re planted and make a difference right where you are, right now. You don’t have time to sit around and wait for the perfect opportunity to be fruitful and productive, because NOW is that time! This very moment, this very second, this very day! Bloom NOW, right where you are! You are the light of this world, BE IT! He has placed you as a lamp, high on a hill, shine by being precisely, fully YOU! And only you know what that looks like and feels like. He made you who you are, be that person today – shamelessly. Be you! Allow yourself to indulge in what it feels like to do the very thing that makes you feel unique and special and then then bask in that warm glow that emits from your very soul. For me, that’s teaching and connecting with children. 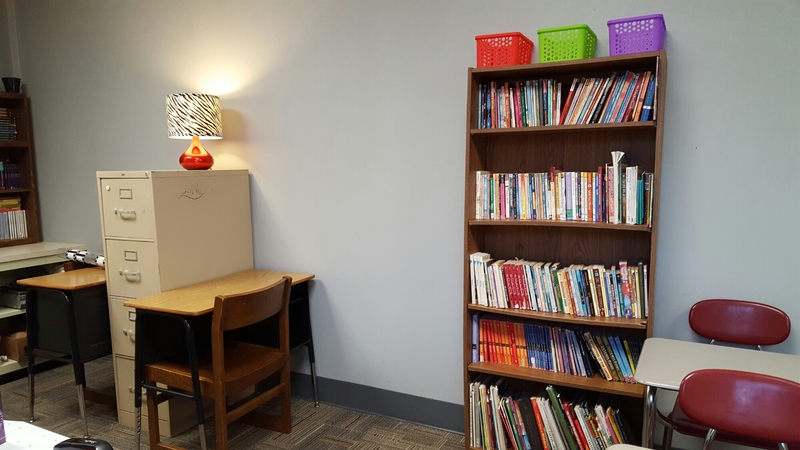 I had been praying about my former position that had been open for the last 8 weeks and I was marveling at how long it had been taking to find someone for my Instructional Assistant position. And at the same time, nervous about it being filled because then that might leave me out of a job if the school decided to go a different direction when my contract was up in December. So I had taken a bit of comfort knowing that it hadn’t been filled and if needed I could always go back to it. Up to that point I had been dutifully going through all the motions of being a Special Education teacher in a middle school. I had even applied to the school of Special Education at Ball State for my masters and have been accepted. But I had done it all out of a sense of duty, not desire. The very next week, last week to be exact, I went on a whirlwind tour of training! Two days in Fort Wayne with the always fabulous Indiana IEP Resource Center. And one day at the Indiana Connected Educator Convention, where I attended a session on telling our stories. Guess who talked me back into blogging more often! And inspired me to buy a headset during my lunch break so I could screencastify – I’ll explain more about that later. To put it mildly, I’m thrilled to be stepping into this role wholeheartedly now. I always put at least 100% into everything that I do, but there’s a mindset shift when you go from doing something because you have to, to doing it because you want to! And I couldn’t be happier to not just accept my role here at SMS, but to embrace it and fully become all that I can be here in it! My blog has always been all about me and the things that I’m thinking and learning and that won’t be changing. However, because my life has changed so drastically in the last few years, so will the content of my blog. Which only makes sense. I’m sure that I’ll still be throwing Bible verses and the Holy Spirit in here from time to time – probably ALL the time. But they won’t be standing alone in the stay at home mommy world any more. They’re going to be set in a classroom full of kiddos that have had the whole world set against them for a very long time. These kids need prayer in a way that I’ve never experienced before! All my life I’ve wanted to be a school teacher. As last school year was drawing to a close the Holy Spirit, through my husband, let me know that THIS was the year that it would happen. THIS would be the year that I would do the very thing I had dreamed of my entire life, teach in a public school. But God never stopped His message, “Trust Me”. So as hope slipped further away with each now closed position I was left with two weeks of summer vacation and a speck of hope the size of a single piece of glitter when my husband and I went up for miracle prayer at church. It was short sweet and to the point – effective. That next day I marched my portfolio into the elementary school principal’s office and basically demanded an interview for the last open position. I didn’t get the job. Yet through the depression, that blasted piece of glitter refused to sweep away and God continued His refrain of, “Trust Me”. Then precisely seven calendar days before school was to start, there was an opening. The glitter bomb exploded, my time had come. And now here I sit, at my TEACHER’S desk, two weeks into school, past the chaos of the last three weeks realizing what God has done. He really IS the God who can do exceedingly, abundantly, above all that we can ask or imagine. In all my years of dreaming and thinking and planning and imagining I NEVER placed myself into this particular role in the school. And yet here I am, sitting on the other side of the summer with every door that I had prayed to open successfully shut in my face. Everything that I had dreamed for myself God looked at and said, “Close, but not quite good enough for MY beloved child.” While I wrestled with rejection all summer, God was lining things up *just* right to set me into the place that He had created for me all those years ago when He had birthed this dream of teaching into my heart. Never, in thirty-six years, had this position crossed my mind as part of the plan. And I’ll be honest, in those first days through this particular door I was a little mad that it hadn’t been those other doors. Yet here I am, with each passing day realizing how perfect this job and I are for one another. A match made in heaven… and it had never been part of MY plan. Go figure. An Outstanding Teacher Who Can Find? So I’ve spent a LOT of time this week of Spring Break working on operation “Get a Teaching Job”. I spent an entire day working on my Resume’, that was fun. And so far I’ve spent all of today working on filling out an online application. Although I will admit that the majority of that time has been spent writing what I’m about to share with you. One of the questions the application posed was, “Describe the skills or attributes you believe are necessary to be an outstanding teacher.” Now, I don’t know about you but that just wasn’t something I could answer in just one sentence and do it justice. And the more I wrote, the more I found myself thinking about the Proverbs 31 woman. It begins, “A wife of noble character who can find…” and then goes on to list all the qualities of a good wife. I found myself writing my own version of the Proverbs 31 Woman… The Outstanding Teacher! A truly outstanding teacher is a good leader by being good with people & organization. As a leader & an outstanding teacher she works with people of all ages from students & their parents to the administration and co-workers. An outstanding teacher strikes a good balance between being too soft and easily pushed around and being too hard and pushing everyone else around. She is a likable person who stands her ground when necessary (especially with students) but will happily accept constructive criticism & follow those in leadership above her as well. 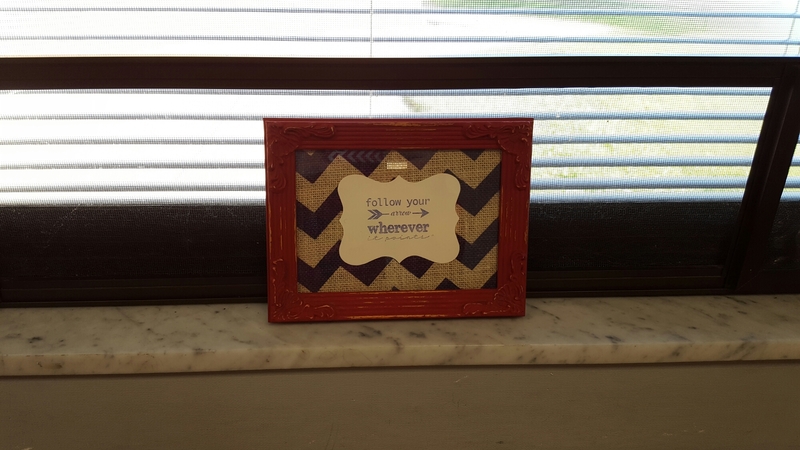 It’s always best to know where we’re going before we leave! For this reason I believe an outstanding teacher, in addition to being good with people, must also be organized. The students & their parents are trusting her to lead them through the daily activities of school, field trips, projects & homework. Those are a lot of plates to keep spinning and it takes a great deal of organization in order to spin them in an outstanding manner. 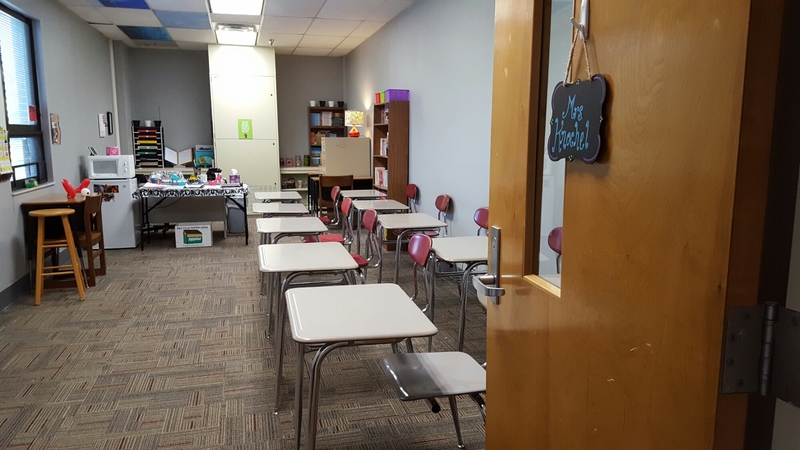 In an average school year of 180 days, the outstanding teacher will spend approximately 900 hours with this next generation. This is why an outstanding teacher is passionate about her students. Nine hundred hours influencing the future is not a responsibility to be taken lightly. The outstanding teacher is passionate for the entire well-being of her students, from education to personality development she takes it all seriously. It is the outstanding teacher’s goal to wake up the thinker, the researcher, the artist, the dreamer, the future person inside each and every one of her students by teaching them the skills they will need to be that future person. In conjunction with passion, the outstanding teacher must possess compassion. Within those 900 hours of teaching and skill building, many of her students will unfortunately have the worst day of their lives. Whether it be as small as the temporary loss of a friendship or as earth shattering as the permanent loss of a parent, these students will experience life and it’s cruelties. An outstanding teacher knows how to be compassionate when these events take place under her care. For a teacher to be unfeeling toward her students during these traumatic life events, no matter how seemingly small, is in my opinion a tragedy. Every moment of life is a teachable moment and sometimes there are more important things in life to learn than the times tables. With that being said, I also believe that many times the best way to weather a life event, is to engross yourself in the glorious routine of school and learning. Knowledge has a way of soothing life’s aches and pains like nothing else can. Last, but certainly not least, the outstanding teacher possesses adaptability. 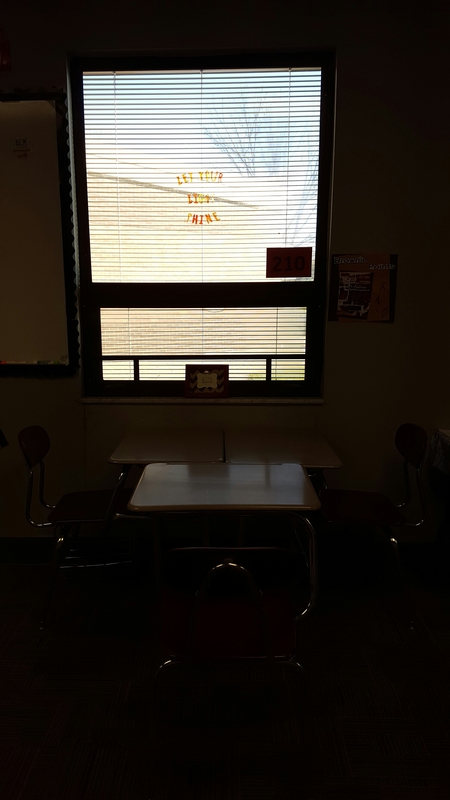 As a teacher there will be curve balls thrown at your head all day every day, from Johnny throwing up in the middle of science class to tomorrow’s meeting getting moved to today… in five minutes. It is an outstanding teacher’s job to be proactively organized & plan the way for her class every day knowing that those plans can and probably will change at the drop of a hat. An outstanding teacher has the ability to make those changes without even making it noticeable that there were any changes at all. In addition to adapting to the daily changes, an outstanding teacher is a timeless one; she doesn’t use the same exact lesson plans for 25 years straight. It is the outstanding teacher’s responsibility to prepare her students for their future, one that doesn’t even exist yet. In order to do this the outstanding teacher knows the world her students live in today and anticipates the world they could create and teaches them to create tomorrow. So what do you think? Would you agree with those statements? Would you hire me? A couple weekends ago, at church, Pastor Steve challenged us to tithe regularly. He even went so far as to have us sign a card letting the church know our intention to tithe in the next 90 days. Now, I’m not new to tithing, in fact, I believe pretty strongly in it. However, I’ve gotten out of the habit and had been thinking about it a lot lately. So when it was brought up in church in such an official way I knew it was time to make a committment. So I did. Now, I’m not going to lie, this last week has been very financially stressful for me. I feel like money has been tighter this week than it has been in quite a while, and that’s saying something! HOWEVER, this morning I was talking to my co-worker who has a small side business and she was telling me about this weekend. She sold more high dollar funiture items in two days than she’s ever sold in that amount of time before. And while I thought that was great, I wasn’t quite getting where she was going with the story. Then she reminded me of their tax situation. Aparently their annual raises brought them just over the tax line where they owe taxes this year instead of the other way around. BUMMER! But it’s not just a little bit of taxes, it’s an amount that makes you GULP when you see it. Especially since they weren’t expecting it. So when she sold that much furniture in one weekend, the obvious message was one of God’s provision. She was so excited about it this morning that her enthusiasm was contagious. Later this afternoon as I was sitting in the orthodontist office with my son Gabe for a “pre-braces” appointment, I was quoted an amount that made me GULP. And as I sat there silently worrying how in the world was I going to make this work out, I remembered her story. The peace came and I calmed down for a bit. And thankfully that’s not the end of my story for today because God is good, and faithful and just. I have committed to tithing and a blessing IS coming. Do you ever feel like you’re never enough? Like no matter how hard you try, no matter how hard you work, it’s never enough? I don’t know about you, but I certainly feel that way… often. And honestly, right now I’m really tired of feeling that way. I’m never going to be pretty enough, I’m never going to be a good enough mom. I’m never a good enough wife. I’m not a good enough teacher. No matter what I do it will never be enough. At least not in my eyes. But there is one person who you will always be enough, Jesus. In His opinion, just the way you are is enough for Him. Or did you not know that you are His workmanship. You have been created in His image, not perfect on your own but perfect in your union with His perfection. It’s incredibly easy to get down on ourselves when we’re functioning in our own power, especially when we are functioning in our own power for a long period of time. Eventually we run out of steam, usually far short of the goal throwing our imperfections and our “not enough-ness” into perfect view. We can’t reach the goal without Him. And we were never meant to. Our “not enough-ness” was crafted into our being from the very beginning! He didn’t make us to be self sufficient, He made us to be dependent on His Grace! Paul ran into a similar situation that I think, I know, I needed to hear today. Can we get to the point where we’re OK with not being enough for ourselves, where His Grace is sufficient for us? 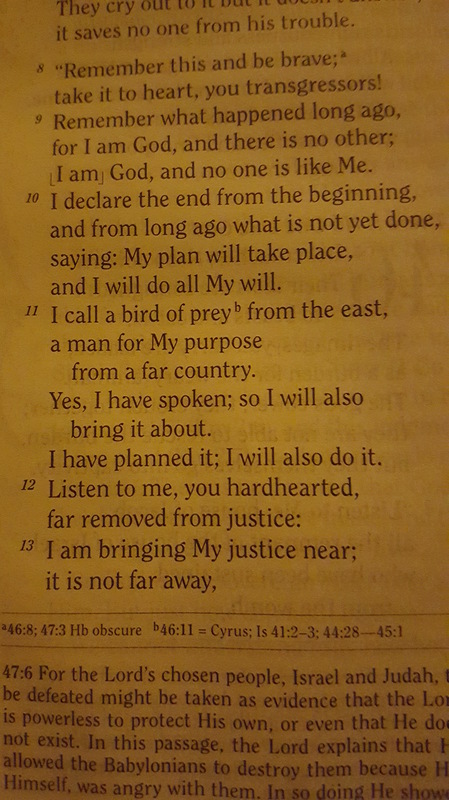 I have times when I have the confidencde that Paul speaks of in this passage. And then I have the, knees on the ground, moments like this. I relapse. But Jesus recovers me. Praise God! He loves us!